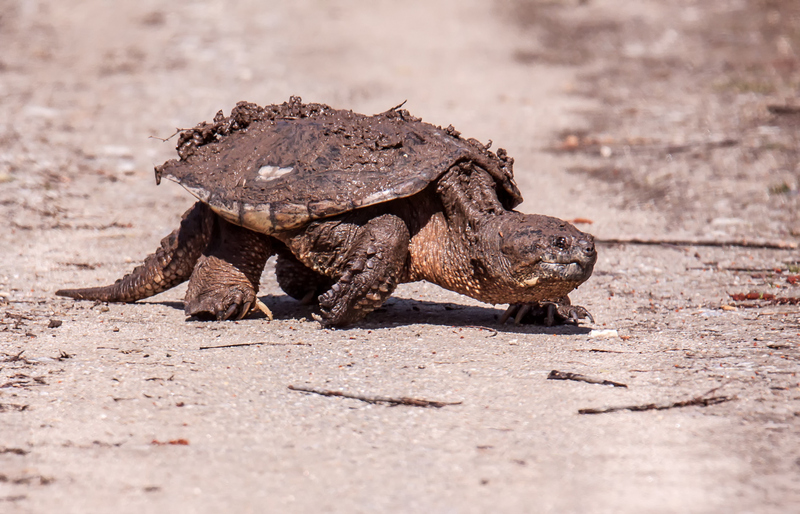 Why did the Snapping Turtle (Chelydra serpentina) cross the road? 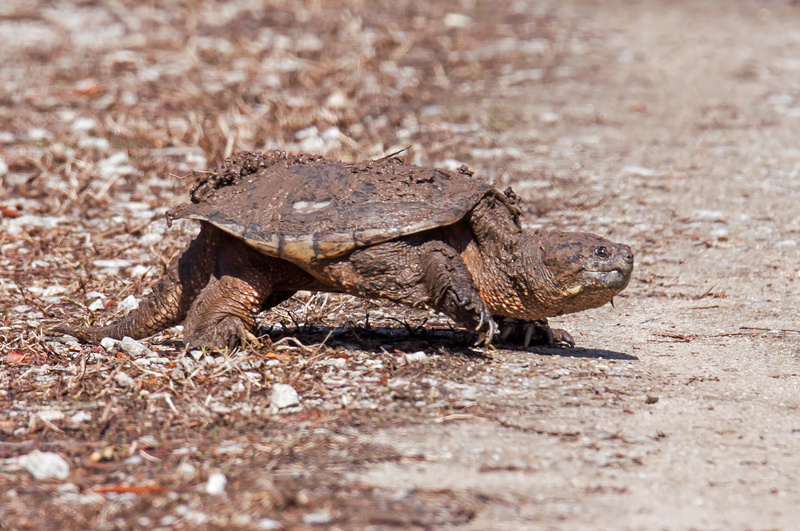 It sounds like the opening line of a joke, but I asked myself that question yesterday when I spotted a snapping turtle lumbering its way across one of the trails at Occoquan Bay National Wildlife Refuge. 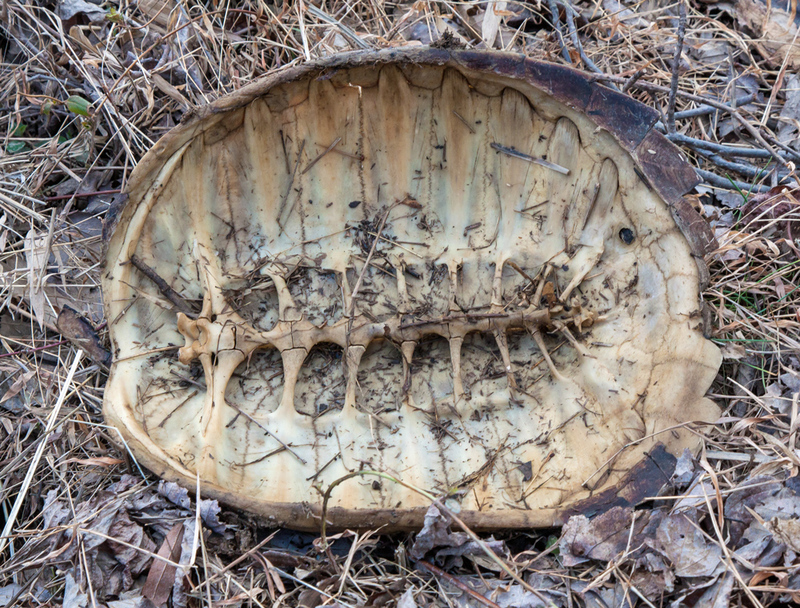 The turtle’s back was covered with mud, suggesting it had only recently emerged from its winter sleep. 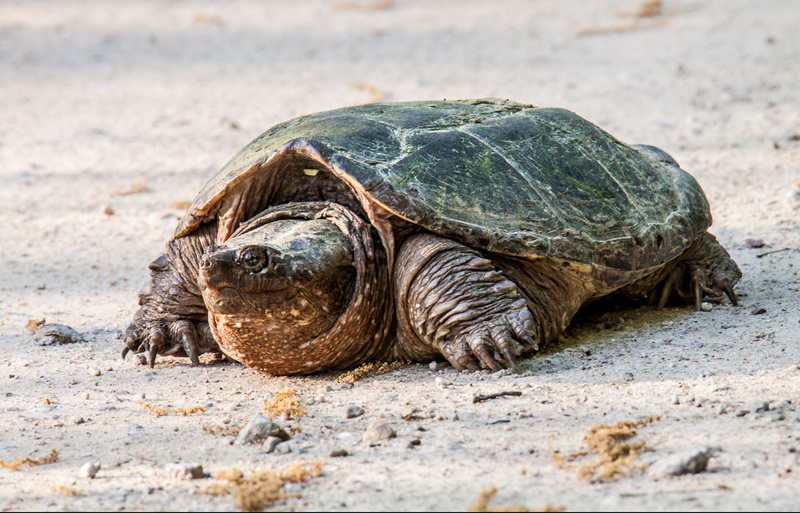 In the past I have sometimes seen snapping turtles out of the water when they were getting ready to lay eggs, though it seems a little early for that to be taking place. 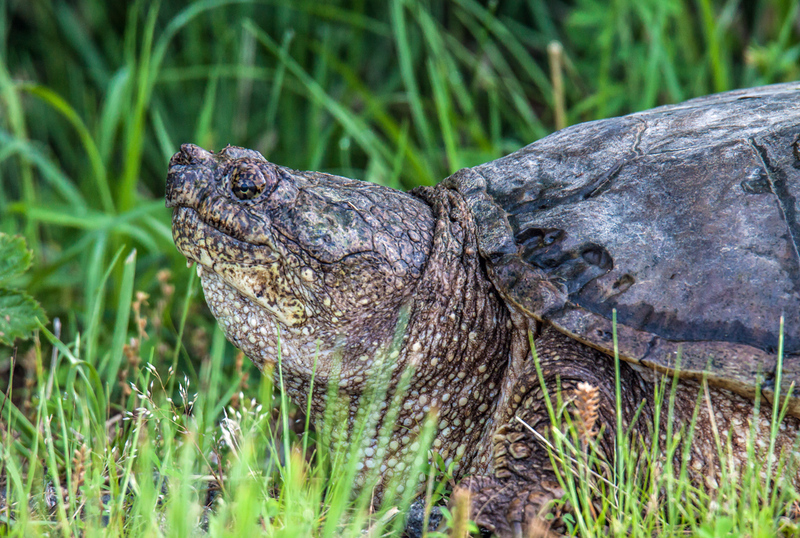 I have always thought that snapping turtle look like dinosaurs. What do you think? This must be egg-laying season for Eastern Snapping Turtles (Chelydra serpentina serpentina) for I have seen them on multiple occasions this past week far away from the water that is their normal habitat. I spotted this venerable one in a grassy field at Occoquan Bay National Wildlife Refuge. I am happy that I was able to capture some of the turtle’s wonderful skin texture and serious expression in this head-and-shoulders portrait. I do realize, of course, that turtles do not really have shoulders—I used a bit of artistic license in characterizing the portrait with those words (and in calling myself an “artist”). When I spotted this Eastern Snapping Turtle (Chelydra serpentina serpentina) from a distance yesterday at Occoquan Bay National Wildlife Refuge, I thought it might be a fox, because of its reddish-brown color. 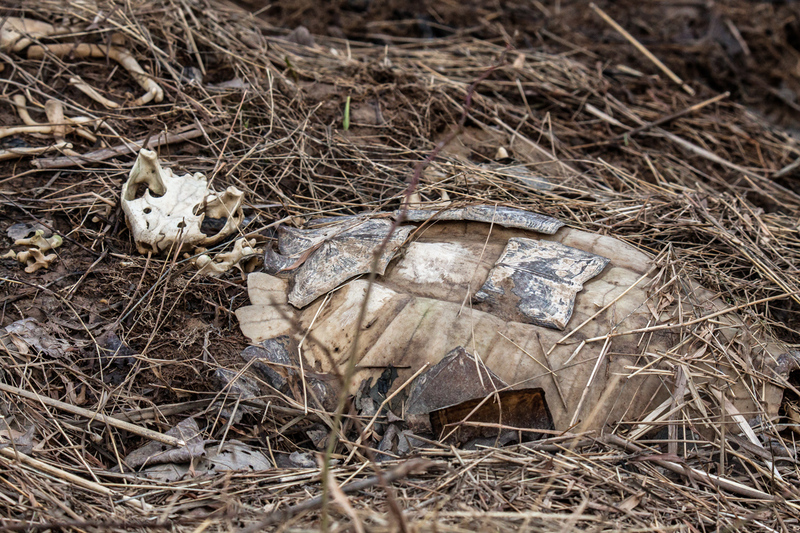 It was only when I got closer that I realized that it was a snapping turtle covered with mud—I suspect that she had recently been digging a nest to bury eggs. I got low trying to do an eye-level shot and am pleased with the expression that I was able to capture. I never know what I will see when I visit Occoquan Bay National Wildlife Refuge. 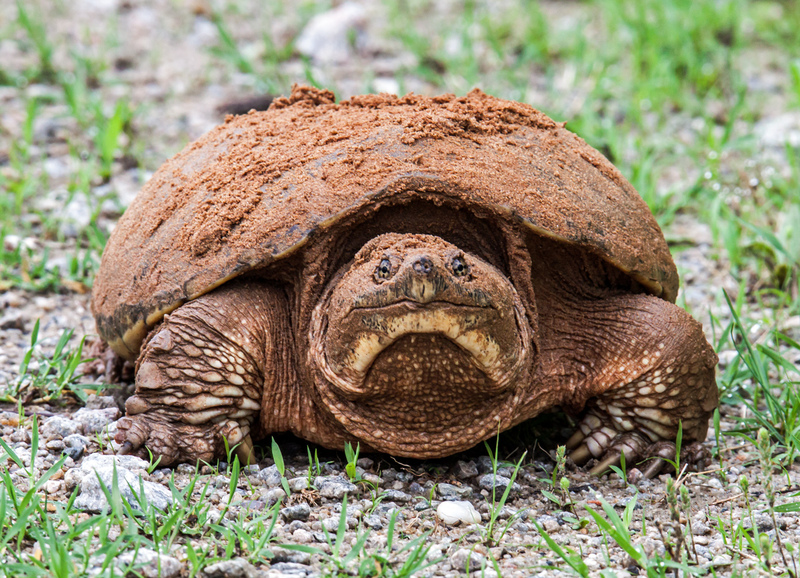 I encountered this large Eastern Snapping Turtle (Chelydra serpentina serpentina) right in the middle of one of the paths at the refuge last Friday. I generally see snapping turtles in the water or sunning themselves at the water’s edge. I only recall a single instance when I have seen a snapping turtle this far out of the water and on that occasion it was digging a hole and getting ready to lay eggs. I wonder if that was why this one was on dry land. The turtle looked like it was relaxing, but I gave it a wide berth after I snapped its photo, wanting to make sure that I was the only one snapping. 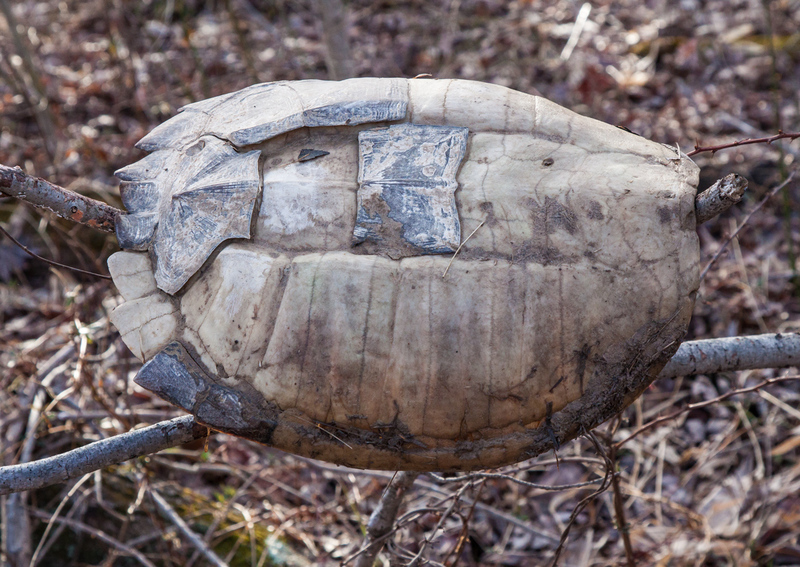 As a child, I remember thinking that turtles could all pull their bodies inside of their shells for protection. 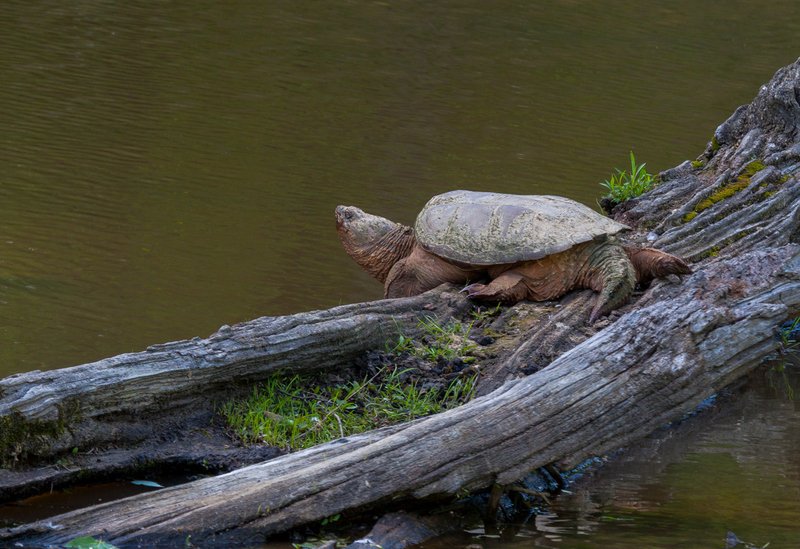 Clearly that is not the case with this prehistoric-looking Snapping Turtle (Chelydra serpentina) that I spotted last week lounging on a fallen tree at Huntley Meadows Park in Alexandria, Virginia. We kept little turtles as pets several times in my family as I was growing up and I remember the clear flat plastic habitat that we used that had a small plastic palm tree. As a product of the suburbs of Boston, I didn’t have a whole lot of experience with wildlife, though I was Boy Scout for a while. To this day I am amazed by the size and apparent power of snapping turtles, which are pretty common in my favorite marshland park. Most of the time I see them moving slowly in the water and only occasionally do I see one sunning itself on a log as the smaller turtles regularly are wont to do—I imagine that it is quite a chore to haul that massive body out of the water. I was a little surprised when an unusually shaped mound of dirt slowly began to move in the shallow waters of a muddy pond at Huntley Meadows Park. 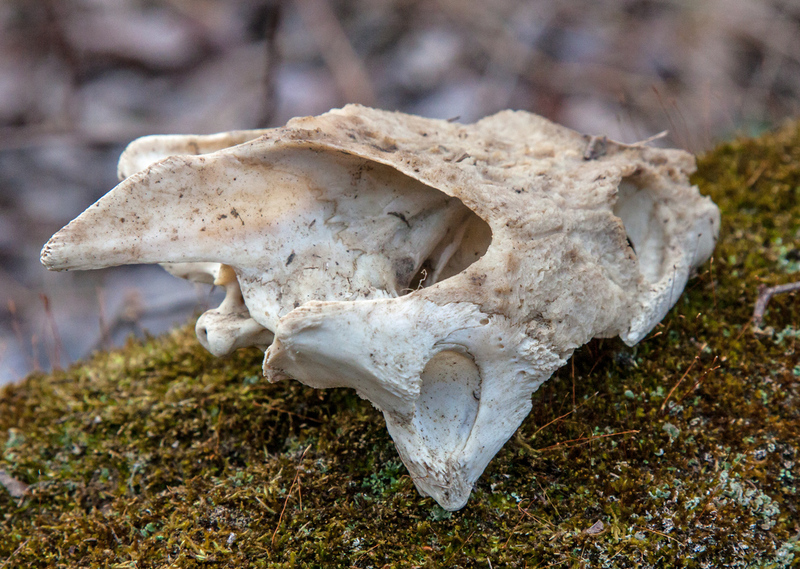 When it raised its massive head, I realized it was an Eastern Snapping Turtle (Chelydra serpentina serpentina) newly arisen from the bottom of the pond. 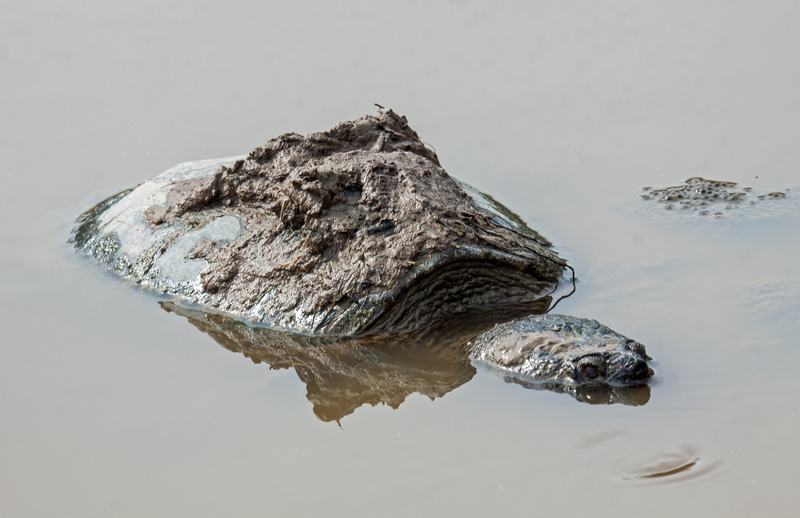 The extra weight of the mud on its back didn’t seem to affect the turtle’s swimming ability—it must be nice to be so big and strong.